Here are my favorite tips for spending less time weeding and more time simply enjoying your garden. 1. Invest in a good weeding tool. It makes me cringe when I see people trying to weed with a knife or worse yet, one of those pronged garden forks. Those are to loosen the soil--not to remove weeds. You're simply cultivating the weeds to help them grow better! A hoe is fine for small weeds in areas like vegetable gardens, but in flower beds and other tight spots, use an Asian plow (also called an EZ digger and other names) or Cape Cod weeder. Once you use them, you'll wonder how you ever lived without them. I know—easier said than done. But getting weeds small saves hours later. And never, ever let weeds go to flower or seed. You might as well go through your garden and plant them from a seed packet. My mantra is funny old-fashioned garden quote I saw once on a little garden sign: "Suffereth not a weed." 3. Weed when it's wet. The best time to weed is right after a rain so you can get roots and all. If the ground is hard, take a break and give the area a good soaking with sprinkler. Then go back several hours later. Each spring, I order about a pickup load of shredded bark mulch from a local landscaper and then spread it 1 to 3 inches deep around everything. You'll reduce watering, prevent disease, and cut the reccurance of most weeds by about half. I wish I were disciplined and relaxed enough to go totally organic. But I'm not. Instead, I simply keep chemicals to a minimum. So when I am finding it difficult to keep up with my weeds, I take a two-step approach. First, in the early spring, when the bright yellow forsythia is blooming, I sprinkle an application of Preen (or any other pre-emergent weed killer) on all my flower beds. Preen prevents seeds of any sort from germinating, and lasts for months in the soil, so don't put it on vegetable gardens or any other place you're going to plant seeds. Secondly, in mid-spring, when the dandelions and creeping charlie are coming on full force, I purchase a big pump jug of Roundup with a nifty spray handle on a little hose. Fifteen minutes later, many of my worst weeds are kaput. Apply Roundup on a dry, sunny day. And you may need to do one or two more applications to truly kill them. 6. Know when to pull and when to hoe. Hoeing is good only when weeds are less than an inch tall or wide. Pull all other weeds, using one of the above weeders to uproot them or slice them off. But be careful. Some weeds, such as purslane, can be spread by hoeing. When you cut and scatter tiny bits through the soil, they grow into new plants. So you're not weeding as much as propagating! 7. Weed in the fall. By the time the mums are blooming, we're tired. It's hot. The garden looks ratty and it's uninspiring to be out working in it. But summon what gardening energy you have left to keep up with the weeding. 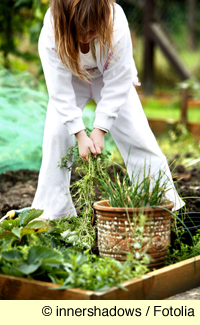 One study showed that fall weeding reduced overall weeding the following year by 75 percent! Which sort of makes sense. Late summer and early fall is when many weeds are going to seed.